David McGrath graduated from an MA in Creative & Life Writing at Goldsmiths University in 2012 and lives in London. 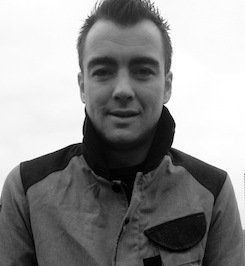 He has won the Peirene Press Short Story Competition, StorySlam at the Royal Festival Hall and was highly commended in the Manchester fiction Prize 2013. He regularly contributes to literary events and performs his short stories across London and beyond. He featured in London LitCrawl 2013 and has worked with Spread the Word for Towersey Festival and performed at Rattles Tales in Brighton. He received Most Valuable Player for writing from Liars League, London 2013. Rickshaw is his first novel. No publisher will have more finalists at the 2017 People’s Book Prize awards than the agency’s imprint Thistle Publishing, which is represented in both Fiction (Rickshaw by David McGrath) and Non-Fiction (A Life in Death by Richard Venables and Kris Hollington, Irreplaceable by Louise Moir) categories. Two agency titles - David McGrath’s scintillating debut novel Rickshaw, and gripping police memoir A Life in Death - have been longlisted for The People’s Book Prize. Both are published by Thistle Books. You can vote for them here. David McGrath recently gave a reading at a meeting of Waverton Good Reads, after which all copies of his exhilarating debut novel Rickshaw were quickly snapped up. David McGrath’s thrilling debut novel Rickshaw hit No.1 in the Australian Kindle bestseller list at the weekend. Mashable has interviewed Dave McGrath, author of new novel Rickshaw. 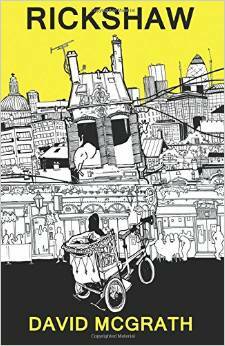 David McGrath’s new novel Rickshaw has received a terrific review from Open Pen. Debut novelist David McGrath was the cover star of the Irish Post at the weekend, discussing his novel Rickshaw in an entertaining interview.